First things first… Happy Veteran’s Day! I’m sending all of my gratitude to the men and women who have served our country. Even though my gratitude hardly seems like enough, please know that your sacrifice and service is appreciated so very much — today and every day. How are you guys doing today? My day started off with a thigh-shaking workout at Pure Barre. I think Pure Barre may be the best 6 a.m. workout for me because I rarely have to psych myself up for a class. It can be hard to feel motivated to work out when the alarm goes off and I’m cozy and warm under my covers, but there’s something about Pure Barre that my body seems to crave that makes it a little easier to get out of bed before the sun comes up. Whatever it is, I’ll take it! After today’s class I headed home with one thing on my mind: Coffee! When I went to Fresh Market last week and saw all of their holiday flavors on display, I quickly noticed that my beloved peppermint crème was missing. 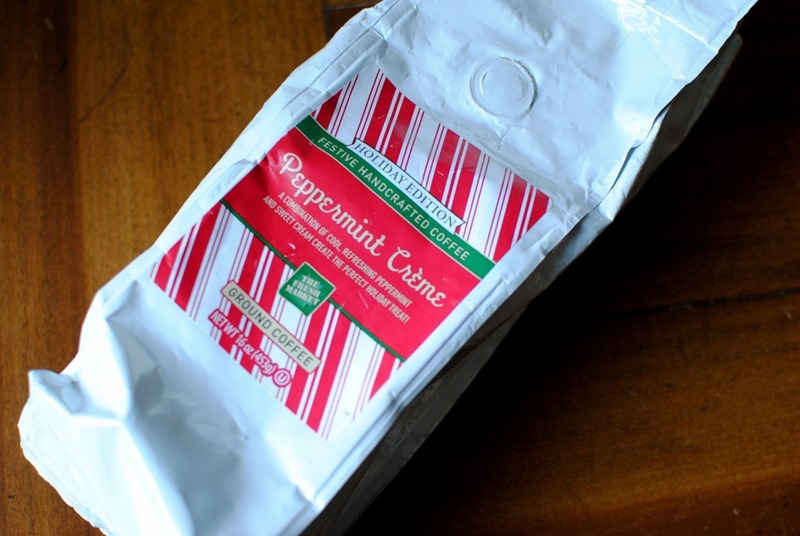 After tweeting back and forth with the store, I found out they’re not making it again this year so now I am on a mission to find a replacement peppermint-flavored coffee. If you have one you love, please let me know! I enjoyed my hot coffee with a cold smoothie. 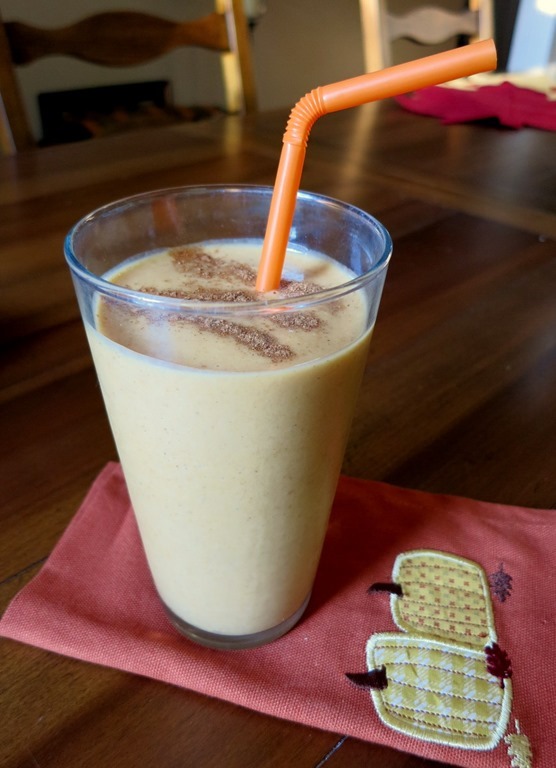 Today’s smoothie was a pumpkin pie smoothie of sorts and I combined pumpkin and vanilla protein powder with milk, pumpkin pie spice and almond butter to make the filling drink. And now I’m off to work… No teaching today – just helping out around the gym! I can’t believe they discontinued Peppermint Creme! I stock up every year as well and even give it out as gifts. I wonder why? Dunkin makes a peppermint (K cups too) and Gloria Jean’s always has awesome flavors – they used to have a holiday white chocolate mint (I think?) that was awesome. A lot of their locations shut down but there are some still around! 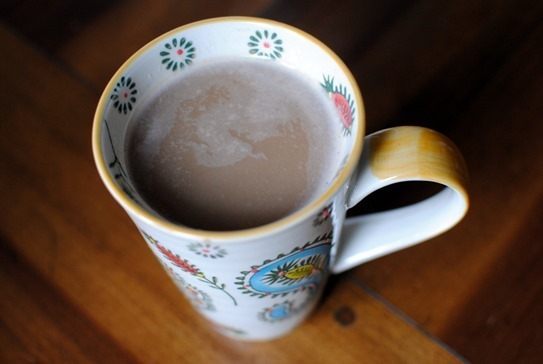 Van Houtte makes K-cups that are White Chocolate Mint light roast and they’re awesome! I know exactly how you feel. I went to look for it too and was disappointed. I bought the Holiday blend sample bag they featured this year, but it is nothing to write home about. I too am looking for a great replacement, so if I find one I will definitely let you know!